Hundreds of BSNL DOT Pensioners who came from all parts of the country held an impressive Sanchar Bhawan March on 15-03-2019. The March was organised as per the decision of the 3rd triennial All India Conference held at Kolkata on 23-24 February, 2019. The pensioners assembled at Eastern Court at 10AM and the inaugural meeting was presided over by Com. V A N Namboodiri, Veteran leader and Advisor. Com.K G Jayaraj, General Secretary welcomed one and all and explained the situation under which AIBDPA is forced to conduct the Sanchar Bhawan March. Though the Communications Minister had given a categorical assurance to the AUAB leaders on 03-12-2019 that pension revision will be processed early, delinking wage revision, the dominant buerocracy at Depatment of Telecom is still not ready to change their mindset of pension revision after pay revision. It is nothing but a drama being enacted with the connivance of the government to delay the settlement. 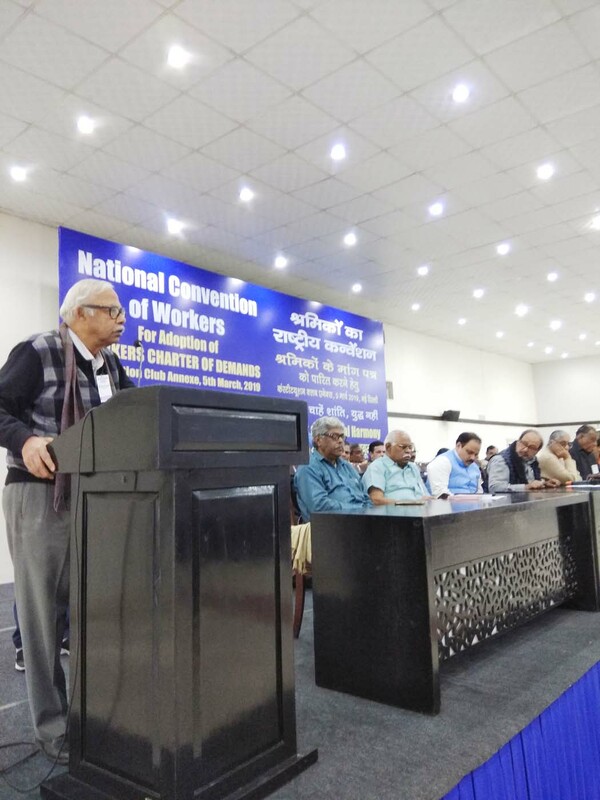 Com.K K N Kutty, Secretary General, NCCPA inaugurated the meeting and explained how the Modi government has denied the legitimate demends of the pensioners in a treacherous manner despite assurance by the grouo of Ministers. Speaking on the occasion , Com.K.Sebastin, General Secretary, SNEA appreciated the demand of AIBDPA, Pension revision with 15% fitment recommended by 3rd PRC from 01-01-2017 delinking wage revision. He reminded that the pension revision done earlier from 01-01-2007 was with 30% fitment recommended by the 2nd PRC and the future pension revisions also should be based on the maximum fitment that may be recommended by the PRCs. Com.Dahiya, Dy General Secretary, SNEA, Com.Balbir Singh, Vice President, BSNLEU and R.S.Chouhan, AGS, AIBDPA also addressed the March. After the conclusion of the inaugural meeting the March started at 1130 and the comrades came from various states , shouted the slogans in different languages exihibiting their anger and anguish against treacherous stand of the government and buerocracy in DoT on pension revision. When the March reached the Parliament Street, the police blocked it and then the entire comrades joined the NCCPA Fast held at Jantar Mantar on the 10 point charter, including pension revision to BSNL retirees. AUAB DECIDES FOR SANCHAR BHAWAN MARCH ON 05-04-2019 AND WIDE CAMPAIGN FOR REVIVAL OF BSNL- SEE THE CIRCULAR. meetings were presided over by Com.Chandeshwar Singh, Chairman, AUAB. threadbare discussions, the following decisions are taken unanimously. parties are to be invited to address this Rally. about the present financial crisis being faced by BSNL. (3) All political parties are to be approached, seeking their support for the revival of BSNL. leaders, seeking their support for the revival of BSNL. contained in AUAB’s charter of demands. election, seeking their support for the revival of BSNL. the CMD BSNL, demanding to stop the same. (9) All BSNL employees are to open their twitter account and also to follow “Save BSNL”. (10) Next meeting of the AUAB will be held at 14:30 hrs. on 25.03.2019. ALL AIBDPA UNITS ARE REQUESTED TO FULLY COOPERATE WITH THE RESPECTIVE AUAB UNITS TO MAKE IT A COMPLETE SUCCESS. SALARY FOR FEBRUARY TO BSNL EMPLOYEES TO BE DISBURSED ON 20-03-2019. Payment of salary for the month of February, 2019, to be made by 20.03.2019 – CMD BSNL assures to the AUAB. The representatives of the AUAB met Shri Anupam Shrivastava, CMD BSNL today at 10:30 am. Ms.Sujata T. Ray, Director (HR) was also present. The AUAB demanded that the salary for the month of February, 2019, should be paid before the Holi festival. The CMD BSNL explained the present financial position of the Company briefly, and assured that payment of salary would be made by 20th March, 2019. GEARING UP FOR THE SANCHAR BHAWAN MARCH. Comrades from far off circles have started their journey to New Delhi to participate in the Sanchar Bhawan March on 15-03-2019. The agitation was decided by the Kolkata AIC against the complete negative stand of DoT on pension revision with 15% fitment, delinking wage revision, as assured by the Communications Minister in the discussion had with AUAB on 03-12-2018. All the participating comrades are requested to assemble at Eastern Court at 0930 so that we can statrt the March at 1000hrs. LET US JOIN IN HUNDREDS AND MAKE IT A GRAND SUCCESS. FINALLY, VICTORY SHALL BE OURS..
After the Sanchar Bhawan March the entire comrades will join the Fasting Dharna of NCCPA at Jantar Mantar. This entry was posted in Uncategorized on March 13, 2019 by admin. HARYANA CIRCLE CONFERENCE HELD SUCCESSFULLY. 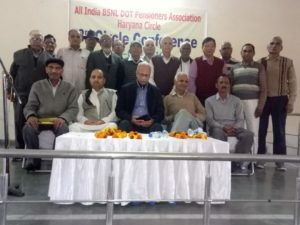 The 3rd Haryana biennial Circle Conference has been held successfully at Jat Bhawan, Rohtak on 09-03-2019. Com. M S Kadian, Circle Patron & Circle Secretary, BSNLEU controlled the proceedings. Com.K G Jayaraj, General Secretary inaugurated the conference and explained the current developments on pension revision, wage revision, financial crisis in BSNL and the dcisions of Kolkata AIC. He appealed to make the Sanchar Bhawan March and NCCPA Hunger Dharna on 15-03-2019 a grand success with good participation. He also gave a good account of the organisational issues in Haryana Circle and requested everybody to strengthen AIBDPA. Coms. Ramesh Kumar, All India Organising Secretary, BSNLEU, Naresh Kumar, Circle President, BSNLEU also addressed the conference. Com.Kuldeep Singh, Circle Co-Ordinator presented a brief report and 13 comrades representing Karnal, Hissar, Rohtak,Ambala, Sonipat and Rewari took part in the discussuion that followed. The conference elected the circle office bearers unanimously with the following important functionaries. Com. M S Kadian (Circle Patron) Com. Ramkumar Kalsi (Circle President) Com. Kuldeep Singh (Circle Secretary) and Com. Rajkumar Mehta (Treasurer). GOVERNMENT ISSUES ORDER FOR 12% DR FROM 01-01-2019 TO THE CENTRAL GOVERNMENT PENSIONERS- AN INCREASE OF 3%. 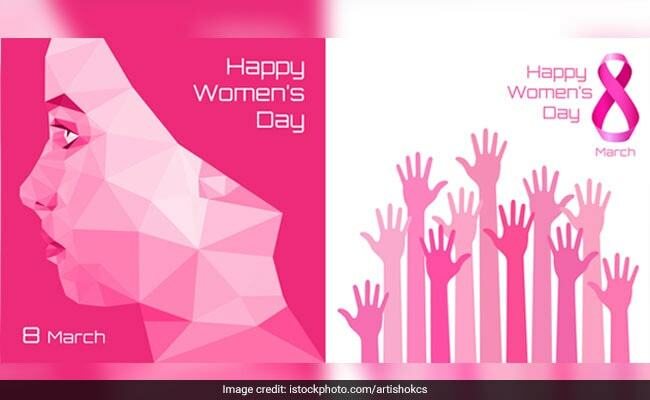 INTERNATIONAL WOMENS DAY GREETINGS TO ALL- LET US CONTINUE THE FIGHT AGAINST ALL DISCRIMINATION AND GENDER BIAS AGAINST THE WOMEN. Non-payment of salary and vindictive actions – AUAB to organise hunger strike at Corporate Office.. The AUAB conducted it’s emergent meeting today the 07.03.2019. General Secretaries /Representatives of BSNLEU, NFTE BSNL, SNEA, AIBSNLEA, AIGETOA, TEPU, BSNL MS, BSNLOA attended. Meeting discussed the following. Non-payment of salary to the BSNL Employees for the month of February 2019. Vindictive actions against AUAB Leaders, particularly leaders of Executive Associations. Issues in the charter of demands submitted by AUAB. After discussion at length on the above issues, following decisions were taken unanimously. To meet CMD BSNL, immediately after the meeting, on the issue of non payment of salary of Feb 2019 and vindictive actions. To organise Relay Hunger Strike from 12th March 2019 at Corporate Office. If issues are not settled, hunger strike is to be organised at circle and SSA levels. To organise the March to PMO in April,2019. AIBDPA FULLY ENDORSES THE PROGRAM AND CALLS UPON ALL ITS UNITS TO PARTICIPATE AND MAKE IT A GRAND SUCCESS. The 2nd World Congress of the TUI Pensioners and Retirees of the WFTU has just been held in Bogotá, Colombia, on the 27th and 28th of February, under the slogan “Long and dignified life for Pensioners and Retirees”. A democratic, class-oriented and militant Congress was held, where more than 200 people from all corners of the world were present. The delegates discussed openly and democratically about the reality of the P & R around the world and adopted resolutions and important decisions for the struggles of the future. The WFTU was represented by its Vice President, cde. Valentín Pacho. During the inauguration of the Congress, a video of greeting from cde. General Secretary of the WFTU, George Mavrikos was projected. In addition, a new leadership team was elected and was also drawn up an action plan in order to strengthen the organization over the next five years. NATIONAL CONVENTION OF CENTRAL TRADE UNIONS VOWS TO DEFEAT THE ANTI-WORKER, ANTI-PEOPLE GOVERNEMENT. 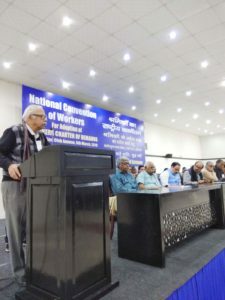 The Central Trade Unions and independent Federations held a National Convention at the Constitution Club Annexe, New Delhi on 05-03-2019. It was jointly presided over by the Presidents of the Central Trade Unions, including Com.Hemalata, CITU and Com.Vijayalakshmi,INTUC. The convention paid homage to the Pulwama martyrs. Leaders of the Central Trade Unions , including Com.Tapan Sen, CITU, Amarjit Kaur, AITUC addressed the convention based on the draft resolution. The convention adopted a 43 point workers charter and decided to raise these issues during the 17 th Lok Sabha elections. It called upon the workers to campaign vigorousl to ensure the defeat of the BJP.